I Am that I Am is from the I AMs of Jesus Collection. I Am the Alpha and the Omega is from the I AMs of Jesus Collection. I Am the Anointed One is from the I AMs of Jesus Collection. I Am the Bread of Life is from the I AMs of Jesus Collection. I Am the Door of the Sheep is from the I AMs of Jesus Collection. I Am the Good Shepherd is from the I AMs of Jesus Collection. I Am the Light of the World is from the I AMs of Jesus Collection. I Am the Living Water is from the I AMs of Jesus Collection. 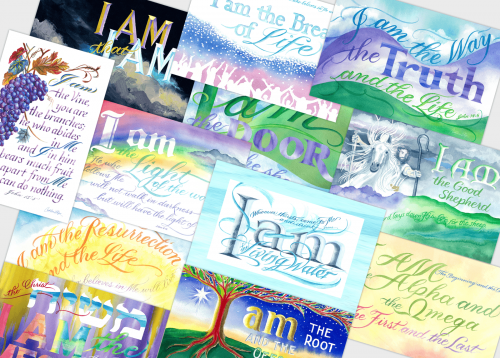 I Am the Root and the Offspring of David is from the I AMs of Jesus Collection. I Am the Vine is from the I AMs of Jesus Collection. I Am the Way, the Truth and the Life is from the I AMs of Jesus Collection.